If you're a goth who loves bright colors, is high-energy, and has a penchant for technology, don't worry- you don't need goth rehabilitation. 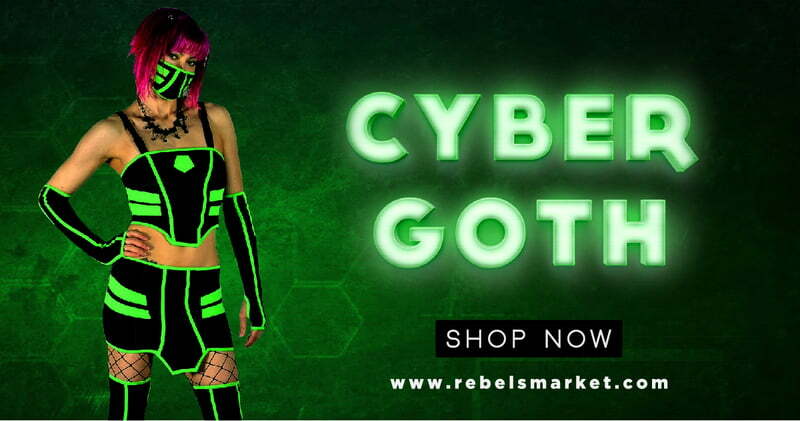 You're just a cybergoth! 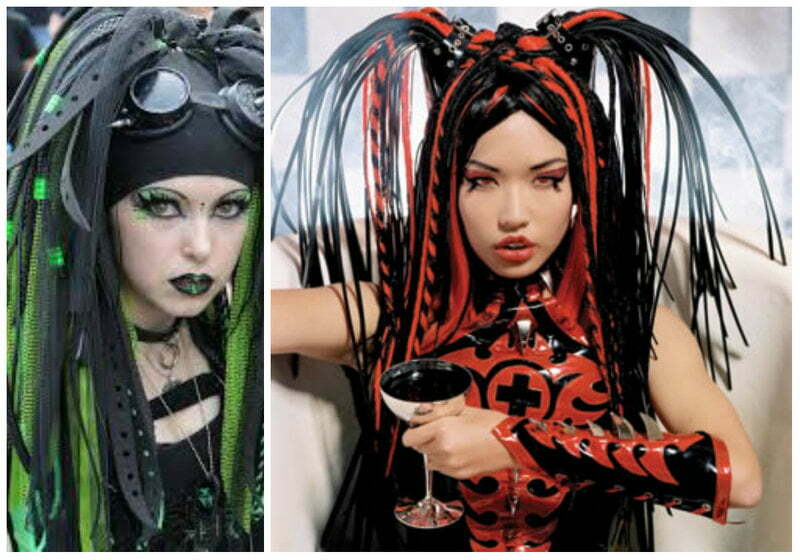 A relative newcomer to the dark side of the scene, cybergoth really came into being around the late 90's, and was largely born out of the crossover from the goth and rave scene in England, a subset originally called gravers. Around 2000, this subset came into their own and began to really gain momentum. Drawing inspiration from classic goth, industrial, and rave culture, the result is a unique blend of all of these styles. Combining the bright colors of the techno scene with the functional black of the goths, the clothing is truly unique. Often utilizing accents in flourescent green, pink, and yellow, there is no mistaking this crowd. Clothing is often short and tight, with lots of accessories like brightly colored (and coordinated) legwarmers, glowing EL wire, multilayered fishnet stockings, colored contacts, gas masks, and ultraviolet-reactive jewelry. Outfits are often elaborate and carefully thought out, as the color themes tend to stay consistent. If an outfit has pink piping, then most of the time the dominant color added to the base black will be pink. 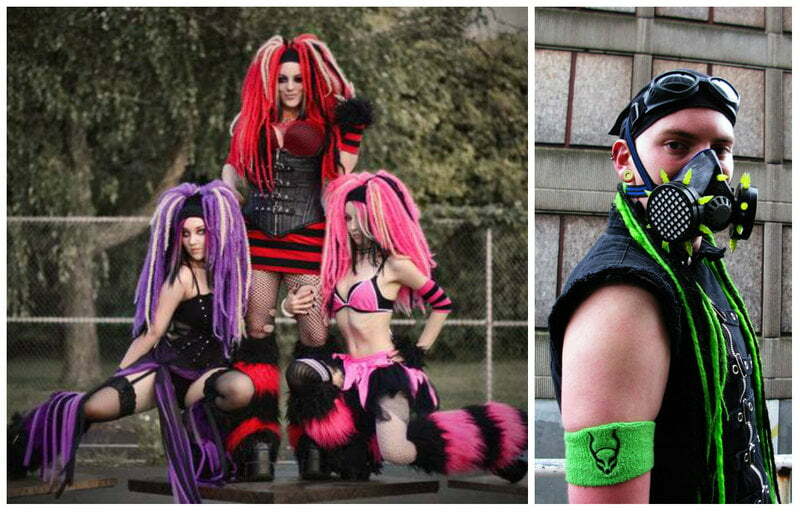 Common themes in cybergoth also occur, with the most common being the biohazard and the radioactive logos. Clothing comanies- particularly English ones- jumped on the trend and make some of the most easily identifiable items even to this day. Brands like Cryoflesh have taken the cyber style and turned it into an eclectic brand, with clothing made not just for clubbing but also more casual pieces for everyday wear. Makeup for the cybergoth is also much more colorful than that of the standard goth crowd. Again favoring flourescent and uv- reactive hues, the designs are often more minimalistic and also more patterned. It is not unusual to see lines drawn aross the cheeks or the bridge of the nose, or to see makeup that is only visible under blacklights. Pale faces are still the norm, if only to make the colors used all the more vivid. Another thing that sets cybers apart is their hair. Again, bright colors are de rigeur, but it's the accessories that really make the style stand out. Often incorporating industrial components like tubing or springy ribbon called tubular crin, these are truly impressive pieces. Big, full, and bouncy, they are often worn in pairs like pigtails, and are quite impressive visually, especially when paired with respirators, goggles, or masks. Shoes for the cybergoth are big. I mean really big- the taller the platform, the better! Some shoes have heels of 7 inches or more, and wedge-style platforms are more favored due to the increased stability when dancing. Boots are the usual style, though there are also some wonderful sneakers that meet the cybergoth's height requirements! As far as music goes, there is a wide range that is common. High energy electronica is always good, as is heavy industrial. Bands like Goteki, Angelspit, Combichrist, and Assemblage 23 are all popular, but everything from Nine inch Nails to The Prodigy are fair game. Anything danceable is welcome, though of course individual tastes are widely varied. 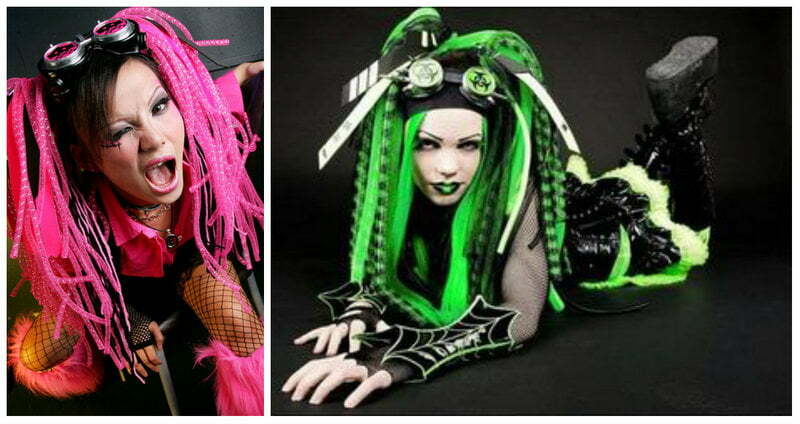 What do you think of the Cybergoth style? Tell us in the comments below!